Note: The IAAF World Junior Championships came to Hayward Field June 22 – 27 and brought some of the best young track and field stars from around the world to Eugene. Travel Lane County’s Juanita Metzler volunteered at the event and wrote a series of blogs sharing her experiences. 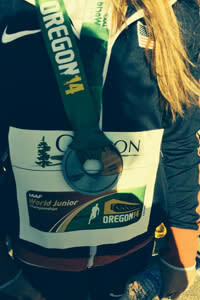 Day 6: The sixth and final day of the IAAF World Junior Championships was no less spectacular in events and results. One final had the top seven finishers all receiving personal best times! As I think back over this past week there are a few things that come to mind that helped make this such a great event. “Thank yous” were given many times over. When the volunteers went to pick up their attire, Vin Lananna, TrackTown USA President, was at the door to greet each person and personally thank us for volunteering. Later at the volunteer/athlete BBQ held at the conclusion of the closing ceremony, Vin again was trying to get to all of the tables to thank each person for being there. Interaction amongst athletes and fans was not only allowed, but encouraged. 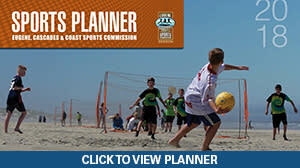 The athletes and attendees interacted in the Fan Zone, the concession areas, and around the University of Oregon campus. 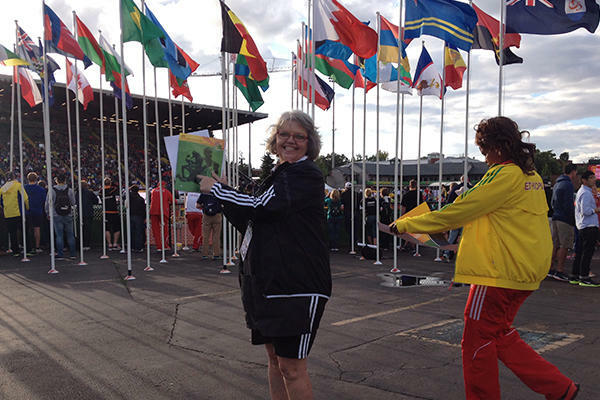 Athletes were more than willing to have photos taken, show their medals, and to sign posters. By the end of the week people from various countries were high-fiving or hugging each other. Email addresses were shared and photos sent to each other. We even had volunteers meeting up with guests from Japan at Tokatee Golf Course. They said that the language of golf is universal. Bike Friday provided bicycles at the event, and a young athlete was attempting to learn to ride a bike after the closing ceremony. She didn&apos;t really have the riding and balancing aspect mastered, but you could hear her giggles and laughter throughout the UO Quad. We had to join in her laughter, as it really was infectious. But mostly what we saw were people of all ages having a really good time. Some went home with medals or personal bests, and others went home with the renewed dream of competing and winning in 2016 IAAF World Junior Championships. 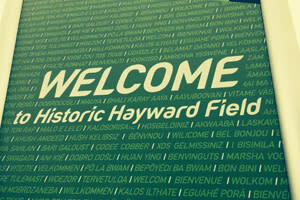 At one of the entrances into Hayward Field is a sign written in many languages welcoming people. It was a reminder of how fun it was to be one of the 1,000 volunteers and that it was such a privilege to be able to welcome people from across the globe to my hometown. Until next time, be safe and keep moving!